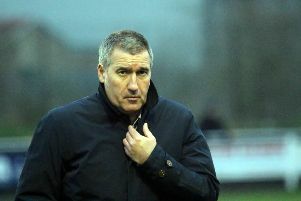 Banbury United boss Mike Ford will be looking for his side to make it five home wins on the spin on Saturday. The Puritans entertain Coalville in Saturday’s Evo-Stik League South clash, looking to bounce back from last weekend’s defeat at premier division central leaders Stourbridge. United’s upturn in form began at Coalville Town back in November and that signalled the start of an eight-match unbeaten run. Since then, United have encountered three defeats on the road but their home form has been excellent and the fans have gone home happy. Ford said: “We’re playing attacking football, scoring goals and look as though we can compete with the top sides. But we have to get the balance right in terms of experience and youth. “Our home form has been very good recently but our away form less so. That is a bit of a role reversal from last season. One of our best performances so far was in the draw with Stourbridge when we had a real attacking team and that’s what I wanted to go with.